Ethanol producers are now in bed with NASCAR, turning America's most popular motorsport into a tool of greenwashing persuasion designed to make being pro-ethanol synonymous with being pro-American, pro-NASCAR. Here's The Daly Planet to explain. — Ed. It was December 2, 2010 when NASCAR Chairman Brian France made the announcement that NASCAR was switching fuels in 2011 to a 15 percent corn ethanol blend under the American Ethanol banner. "NASCAR and American Ethanol are ideal partners," said France. "American Ethanol's new partnership with NASCAR is much larger and more ambitious than a typical sports sponsorship. Here we have an entire industry looking to NASCAR to communicate its message that America is capable of producing its own renewable, greener fuel." In 2011, NASCAR will be using television and radio to communicate exactly that message. TV viewers will see and hear about American Ethanol during every single race weekend for the ten months of the season. While France may have believed he was reaping a bumper crop of sponsor dollars, he may in fact have put NASCAR squarely in the middle of a raging national energy debate. "Ethanol is 20 to 30 percent less efficient than gasoline, making it more expensive per highway mile. It takes 450 pounds of corn to produce the ethanol to fill one SUV tank," said Dr. Walter Williams, economics professor at George Mason University. "That's enough corn to feed one person for a year." "There is nothing more American than NASCAR and there is no fuel more American than ethanol." said Tom Buis, CEO of corn ethanol promoter Growth Energy. "We are so proud that the bounty which America's farmers produce throughout the week will be used in NASCAR racing on Sunday." "Higher blends of ethanol do not significantly impact miles per gallon," said Growth Energy's Buis to the San Antonio Express-News. "Since NASCAR has moved to E15, its drivers have not detected any notable decline in MPG. Instead, they've seen an increase in horsepower." This news from the Wall Street Journal last week: "Although ethanol advocates cite research saying E15 won't damage vehicles, auto makers hold that E15 could harm car and light truck engines and void their warranties. The Alliance of Automobile Manufacturers, representing Ford Motor Co., General Motors Co., Toyota Motor Corp., and other auto companies, filed a petition with a U.S. appellate court in Washington on Monday challenging the EPA's approval for the sale of gasoline containing 15% ethanol." Needless to say, that directly puts three key NASCAR manufacturers publicly against the exact same fuel that NASCAR has just committed to run for the 2011 season. "Anytime you have Paul Krugman (NY Times) agreeing with the Wall Street Journal (News Corp.), Reason Magazine (Libertarian), Investor's Business Daily, Rolling Stone Magazine, the Christian Science Monitor, John Stossel (click here to view), The Ecological Society of America, the Heritage Foundation (Republican think tank), George Will and Time Magazine you know that corn ethanol has to be one of the most misguided public policies in US history," said University of Michigan economics professor Mark Perry. 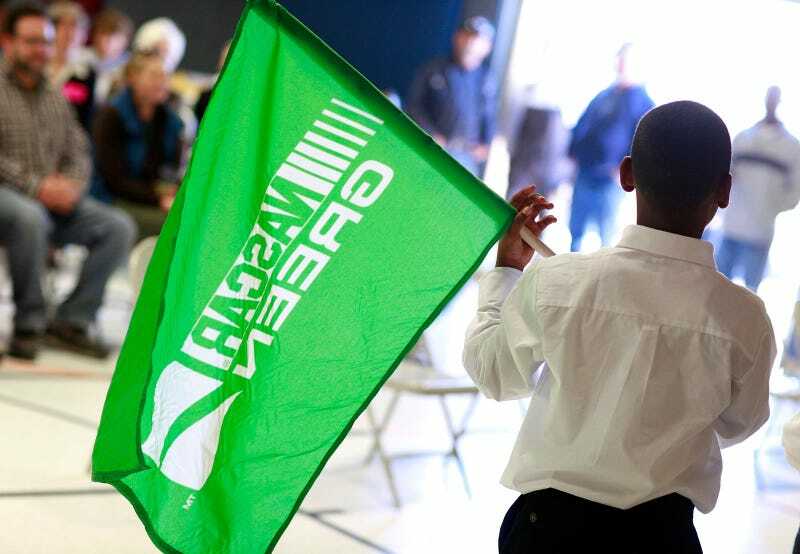 Get used to the term "American Ethanol green flag." That's right, NASCAR's green flag is now sponsored and will have the AE logo imprinted on it. This term will be used on TV and radio coverage for all national NASCAR events on starts and restarts. All of this comes at a time when NASCAR is significantly changing how it deals with the public and the media. Click here for a review of the influence that the Taylor marketing firm is having on the sport. In 2011, NASCAR will have an even tighter leash on what can be said about the sport and who can say it. The positive marketing of all things NASCAR will be the emphasis and public relations for NASCAR, including social media like Facebook and Twitter, will be controlled by professionals used to promoting products to consumers. The corn ethanol lobby has already flooded the Internet with positive stories, using the same online marketing tactic as companies like ExtenZe and US Fidelis. A casual Google search for information on corn ethanol forces users to sift through tons of content created by brand marketers. Next season, NASCAR fans will be confronted with a extensive campaign championing corn ethanol as a great American innovation for energy independence. NASCAR will be positioned as the perfect example of what is right with this energy product. Whether the American Ethanol sponsorship turns out to be a financial windfall for NASCAR in a tough economy or an ill-advised strategic move that ultimately drags the sport into an even wider debate about renewable energy has yet to be seen. Either way, this could wind-up being the big media story of 2011. No other professional sport has as much TV coverage as NASCAR and The Daly Planet's the place for fans to talk about NASCAR TV and hot sports media topics.